Wisk yourself mentally away to gorgeous coastal California with our San Simeon Window Box Cage. 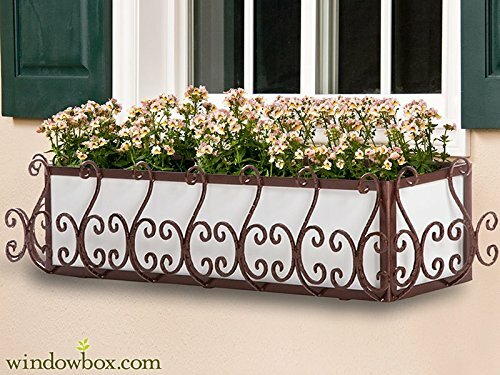 Each of these wrought iron window boxes are handmade and then powder coated in Textured Bronze finish, making these planters rust resistant. Complete with a built-in mounting strip for easy installation, San Simeon window boxes can be installed in minutes with minimal hardware and little effort. Iron cages fit 8" terra cotta pots, but you can also choose a composite PVC insert or one of the following metal window box liners.